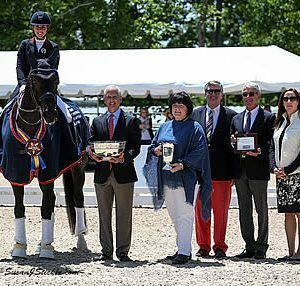 Gladstone, N.J. – The Dutta Corp. U.S. Dressage Festival of Champions came to its conclusion on Sunday with three national champions being crowned. All competitors in the USEF Grand Prix Dressage National Championship, USEF Intermediaire I Dressage National Championship, and USEF Young Adult “Brentina Cup” Dressage National Championship presented by Dressage Today performed their freestyle tests in order to earn the remainder of their overall championship score. Kasey Perry-Glass, Adrienne Lyle, and Kaitlin Blythe were crowned national champions. A talented field of seven combinations competed for top honors in the USEF Grand Prix Dressage National Championship with 45%, 40%, and 15% of their overall championship score coming from the Thursday’s FEI Grand Prix Test, Friday’s FEI Grand Prix Special, and Sunday’s FEI Grand Prix Freestyle, respectively. 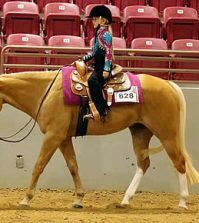 Perry-Glass (Orangevale, Calif.) and Goerklintgaards Dublet added a USEF Grand Prix Dressage National Championship title to their resume by winning with an overall score of 71.575%. They put in a lovely test to win the FEI Grand Prix Test with a score of 73.700%, and had a few bobbles in the trot work of the FEI Grand Prix Special to finish fifth with a score of 68.529%. The duo did not have a completely clean performance in the FEI Grand Prix Freestyle but high degree of difficulty movements and a great artistic flow allowed them to finish second in the class with a score of 73.325%. Adrienne Lyle (Ketchum, Idaho) and Salvino received the Reserve Champion title after finishing on an overall score of 71.344%. They had a flowing performance in the FEI Grand Prix Test to finish second with a score of 70.600%, and were second again in the FEI Grand Prix Special, despite bobbles in the first piaffe and the one tempi changes, with a score of 70.314%. Lyle and the Salvino Partners, LLC’s 2007 Hanoverian stallion finished the championship on a high note by winning the FEI Grand Prix Freestyle with a score of 76.325%. Lyle used the music from her freestyle with Wizard, her longtime partner and 2012 Olympic Games mount, and changed the timing to match Salvino’s movement. Olivia LaGoy-Weltz (Haymarket, Va.) and Lonoir finished third in the championship with an overall score of 70.927%. They performed a smooth test to finish third in the FEI Grand Prix Test with a score of 70.400% and won the FEI Grand Prix Special with a score of 70.686%. 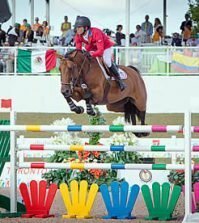 LaGoy-Weltz and her own 2004 Danish Warmblood gelding gave another solid effort in the FEI Grand Prix Freestyle, highlighted by passage half-passes and quarter turns in the piaffe, to finish third with a score of 73.150%. Sixteen combinations rode for the title in the USEF Intermediaire I Dressage National Championship with 40%, 45%, and 15% of their overall championship score coming from the Thursday’s FEI Prix St. Georges Test, Saturday’s FEI Intermediate I Test, and Sunday’s FEI Intermediate I Freestyle, respectively. Lyle and Horizon performed well and showed much promise for the future on their way to winning the USEF Intermediaire I Dressage National Championship with a score of 70.967%. They had an unfortunate bobble in their changes in the FEI Prix St. Georges Test but recovered well to finish in fifth place with a score of 69.763%. The duo had a fantastic performance in the FEI Intermediate I Test to win with a score of 70.526%. Lyle rode Betsy Juliano’s 2007 Oldenburg mare to flashy music, including “It’s Raining Men.” They wowed the judges with difficult movements, such as canter pirouettes into tempi changes, to win the FEI Intermediate I Freestyle with a score of 75.500%. Jane Cleveland (Wellington, Fla.) and Monique earned the Reserve Champion title with a score of 70.768%. They painted a lovely picture, aside from one bobble in the change after the medium canter, to win the FEI Prix St. Georges Test with a score of 70.789%, then had a solid test to finish fourth in the FEI Intermediate I Test with a score of 69.947%. Cleveland and her own 2009 Danish Warmblood mare had an impressive freestyle performance with upbeat music coming from Cleveland’s barre class, finishing second in the FEI Intermediate I Freestyle with a score of 73.175%. Lyle also finished third in the championship with Harmony’s Duval on a score of 70.466%. She finished second with Harmony’s Duval in the FEI Prix St. Georges Test with a score of 70.605% and finished in third in the FEI Intermediate I Test with a score of 70.132%. Lyle and Duval Partners LLC’s 2008 Dutch Warmblood gelding performed their freestyle to dramatic music that complemented the gelding’s movement to place fourth with a score of 71.100%. A field comprised of seven rising stars competed for the title in the USEF Young Adult “Brentina Cup” Dressage National Championship presented by Dressage Today with 40%, 45%, and 15% of their overall championship score coming from the Thursday’s FEI Intermediate II Test, Friday’s FEI Grand Prix 16-25 Test, and Sunday’s FEI Grand Prix 16-25 Freestyle, respectively. 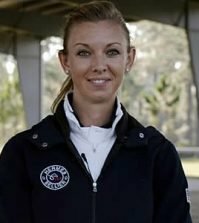 Kaitlin Blythe (Rougemont, N.C.) and Don Principe won the USEF Young Adult “Brentina Cup” Dressage National Championship presented by Dressage Today with an overall score of 66.769%. They performed a fluid test, aside from an error of course, to finish second in the FEI Intermediate II Test with a score of 66.684%. Blythe and Maryanna Haymon’s 1999 Hanoverian stallion displayed quality movements in the FEI Grand Prix 16-25 Test to finish second with a score of 66.000%. The duo had great canter work in the FEI Grand Prix 16-25 Freestyle to win with a score of 69.300%. “I’m thrilled with my horse. He loves the freestyle. It is his favorite thing; he just lights up in the arena. I cannot believe this is real life, actually; it is so surreal. I’m so thankful for everyone who helped me get here,” Blythe said. Natalie Pai (Wellington, Fla.) and Unlimited were the Reserve Champions, ending on an overall score of 66.444%. They had a few moments of tension in the FEI Intermediate Test to finish third with a score of 66.447% but an improved performance in the FEI Grand Prix 16-25 Test to win the class with a score of 66.605%. Pai and Peacock Ridge, LLC’s 2001 KWPN gelding showcased clean changes and half turns in the piaffe in the FEI Grand Prix 16-25 Freestyle to place third with a score of 65.950%. Molly Paris (Charlotte, N.C.) and Countess finished third in the championship with an overall score of 65.992%. They had a great performance to win the FEI Intermediate II Test with a score of 67.079% and put forth a solid effort in the FEI Grand Prix 16-25 Test to place third with a score of 64.698%. Paris and her own 2002 Danish Warmblood mare performed their FEI Grand Prix 16-25 Freestyle with a high degree of difficulty which included passage half-passes and extended canter to canter pirouettes. However, they had some miscommunications, but finished second with a score of 66.975%.